What kind of woman has Prince Rainier of Monaco taken unto himself for better or for worse? She also is interested in Dr. J. B. Rhine’s theories of extrasensory perception, in Buddhistic theories of reincarnation (of which she believes the Bridey Murphy experiments are interesting evidence), in spiritualism and table-rapping. She loves a good séance with a gifted medium. She is what is known as a “rock hound” because she is fascinated by unusual specimens of minerals and has collected hundreds of them. She is a gourmet, so I hope the Prince has a good chef. If he doesn’t, Grace is likely to take over the running of the kitchen herself. I don’t know who started the myth that she can’t cook. She is a first-rate cook. I know. I tasted her cooking. The night I had dinner at her house in Pacific Palisades her cook had quit. The reason her cook had quit was that the cook’s husband, who was Grace’s chauffeur and handyman, had also quit. Grace pitched right into things and cooked dinner herself. We had an excellent clear soup, spiced with a dash of sherry, a roast leg of lamb, crisp fresh salad, Peach Melba, good coffee… She served a Chateau Latour 1949, which happens to be one of the finest clarets of recent years. She knows and likes to drink good French wines. She prefers French wines to American bourbon or rye. I had the distinction of uncorking the Chateau Latour. I also made the martinis. She drank only one. When the lamb was ready, I carved it. We had to turn the kitchen upside down to locate a carving knife. I cut about a dozen slices as there were four of us to dinner: Grace, her secretary, Nayda (Nadia?) Woods, Morgan Hudgins, a publicity man from Metro who is Grace’s liaison with the world of journalism, and myself. Miss Kelly said my slices were too thick. She then gently and delicately recarved my thick slices into thin ones. As anyone who ever has tried to recarve a slice knows, that is a ticklish job, but she did it with great self-assurance. 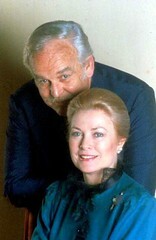 After watching this performance I consider Prince Rainier III one of the most fortunate of husbands. 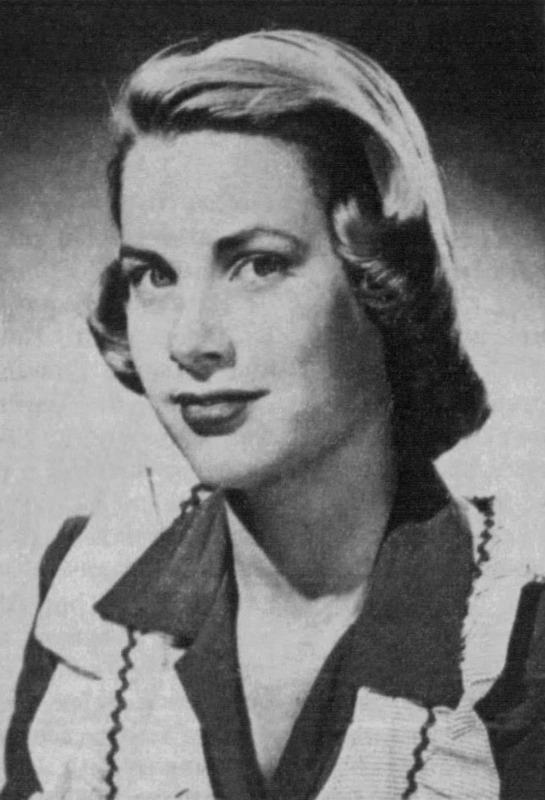 What is it that Grace Patricia Kelly, who at the youthful age of 26 has become one of the best-known women of our time, is seeking from marriage? I believe it is love, companionship and children. Up to now, she has been deprived of emotional fulfillment. As an artist, she has known tremendous success. As a woman, she has had moments of romance, has been courted and kissed but she has not known complete happiness. Now, because her husband wants her to forsake her career, she is staking that career which has represented her independence on the success of this marriage. As surely as the gambler who puts 100,000 francs on a number at the roulette table in Monte Carlo, Grace is taking a big gamble. But she is gambling more than money. She is, in a sense, staking her entire way of life, risking the victory for which she’s struggled so long, the victory that finally compensated for the inadequacy she had felt as a child growing up in an environment for which she felt unfitted. Her dolls still have so much reality to her that she clings to every one she ever owned. She was horrified when her mother once suggested that she hand on her enormous collection of dolls to her sister Peggy’s children. “I absolutely refused,” she told me, “because I expect to give them to my own daughters someday.” As she was growing up, Grace could never figure out her father. Every girl craves attention and love from her father, but Grace, being subtle and sensitive, needed a special kind of suave, delicate handling that her father, a gruff man, may have been incapable of expressing. In her romances, Grace has alternated between being attracted to strong, vigorous, masculine, competitive gladiators like her father, and the opposite extreme: a soft, sensitive, polished sort of man. Since she felt curiously frustrated in her attempts to get close to her father, it is natural that she should instinctively seek a completely opposite type. 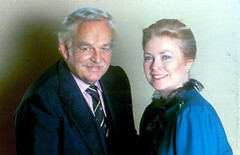 I believe that the reason she fell in love so suddenly and intensely with Prince Rainier III is that he was the first man she came to know who combined, in an unusual way, elements of both types. 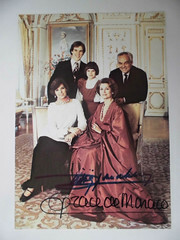 I know that Grace never consciously formulated this thought but I imagine that she instinctively sensed that even if she could never be a basketball or swimming or sculling champion like her brother and sisters she could certainly be the matrimonial champion of the family when she became Her Serene Highness, the Princess of Monaco. One of the most important men in her life was her Uncle George. He was one of the outstanding playwrights of Broadway with hits like The Show-Off, The Torch Bearers, Reflected Glory and The Fatal Weakness. He won the Pulitzer Prize in 1925 with his brilliant comedy, Craig’s Wife. She first became aware of George Kelly when she was about six or seven years old. The same strain of Irish mysticism and melancholy that cropped out in Grace’s character are essential aspects of his make-up. He is a shy, slender, introspective individual, who talks very little and keeps to himself. As Grace watched him during the infrequent visits that Uncle George made to the Kelly household in East Falls of Schuylkill, Philadelphia, she made an identification with him. Uncle George was everything her father was not. He was a poet, an artist, a man who loved to be by himself and play the piano. George Kelly had no interest in business success and athletic triumphs. He also had contempt for Franklin Roosevelt, which was a major heresy in the Kelly family. She was to become an accomplished actress quicker than anybody, including George Kelly, could have dreamed possible. George Kelly still has not completed that play for her. He lives in solitary grandeur in a beach house at Laguna Beach, California. I have heard that he is working on a play in which Grace Kelly could play the leading role. During the periods of movie-making when she was living in Los Angeles, Grace often drove down to Laguna Beach and spent long afternoons with her Uncle George. I think that if George Kelly ever completes that play his niece will temporarily take time out from her royal duties in the palace of Monaco and come back to Broadway to play in it. It was when she was 11 years old that the idea first came to Grace that her destiny was to be a stage performer. She wanted first to be a ballet dancer. She had attended a matinee of the Ballet Russe and was fascinated by Igor Youskevitch. She persuaded her mother to let her study ballet for several years. She also studied piano and took part in amateur dramatic productions. It was important to Grace to cut loose and be independent. New York represented freedom and personal growth. An acting career stood for everything her parents did not believe in, but it was her only way of fulfilling herself, standing on her own feet as a human being. Even though acting is a profession that involves public display, a thing Grace Kelly loathes, it is one way by means of which a woman can quickly gain prestige and status in our culture. Acting, also, for a person as introverted as Grace, is a medium by which one may live out one’s fantasies, and enjoy the satisfaction of make-believe, a thing that Grace has always found more gratifying than reality. 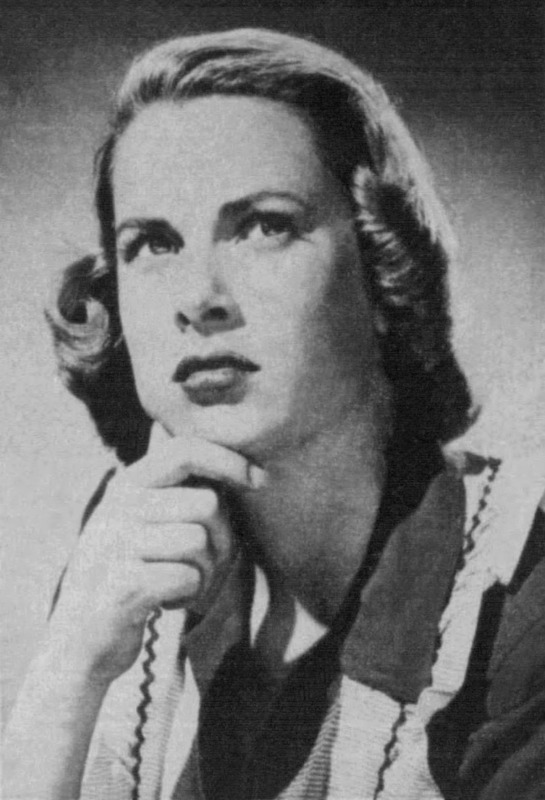 Between 1947 and 1951 she lived in a New York hotel for women. A girl she fell in with suggested that there was good money to be made in modeling. Grace went into modeling with strong misgivings. Going around submitting samples of her pictures to advertising men and photographers was sheer torture. She felt humiliated when she had to approach strangers and smile and ask for jobs. She says she had to grit her teeth to go through with it. She forced herself, though, because she wanted to pay her own way. She was a good model. The face which seemed so prosaic when it wasn’t made up, and when it was masked by her eyeglasses and shyness, became a glowing and lovely face when a good photographer brought out its warm qualities. She quickly became one of the best models in the business and eventually earned as much as $200 a week posing for magazine covers, advertising layouts, catalogs and illustrations. Then she got into television. 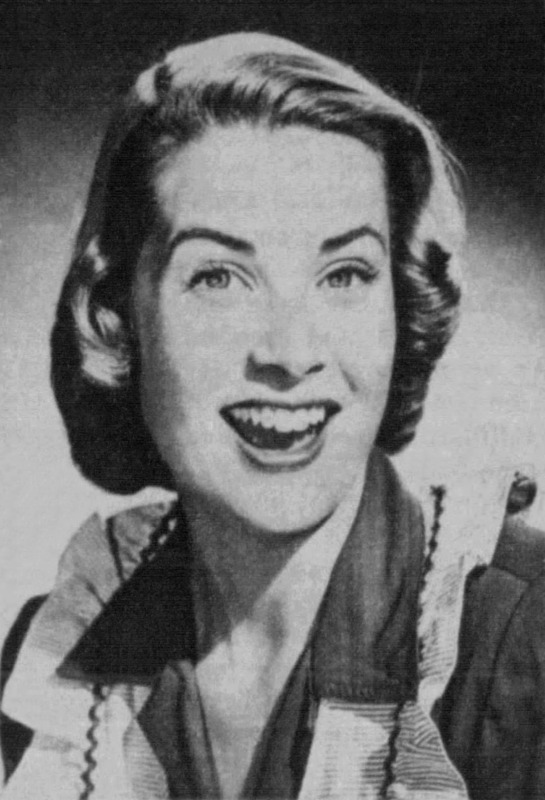 Through producer Fred Coe, Miss Kelly began to get parts in television shows. Oddly enough her first job was a lead, but she later played small roles. She was not an actress of distinction at this stage in her career. She was what might be called a rough diamond. But whenever there was a teleplay that called for a character who was the daughter of a rich family, Miss Kelly was considered for the role. She looked the part and played it well. 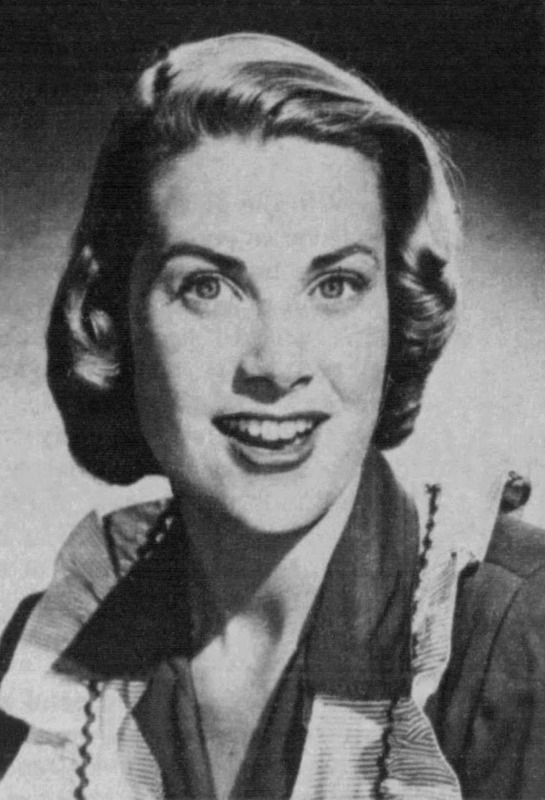 She appeared in over 60 network television plays. In the audience at one performance was Hollywood producer Sol Siegel. He liked her looks. He gave her a small part in Fourteen Hours. She went unnoticed. Her second movie role was as the darling whom Gary Cooper hoped would not forsake him in High Noon. She was then screen-tested by Twentieth Century-Fox. Director John Ford gave her the role of Linda Nordley in Mogambo. With these simple lines, she captured the imagination of moviegoers and, more importantly, the imagination of producer Alfred Hitchcock, who made a star of her. He put her in Dial M for Murder, Rear Window and To Catch a Thief. He slowly guided her until she blossomed as an actress. The culmination of her art came under George Seaton’s directorial hand in The Country Girl. 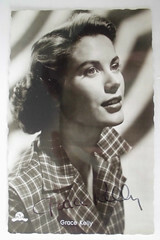 For this she received the Academy Award in 1955. Her usual mask of icy reserve broke up on that night. She wept for almost an hour after she got the Oscar. She had finally made it. She had gambled and won. Now, in marrying Prince Rainier, she has gambled again. Will her marriage lead to new and vexing complications that will force her to find new solutions? Whatever the future may bring, those who know Grace Kelly are sure that she has the intelligence, the character and the strength to resolve whatever dilemmas are ahead of her as Her Serene Highness, the Princess of Monaco.